Cold Splinters is headed up north and east this weekend to the land of Living Free or Dying, so y’all have a good weekend, take care and be safe. And if you need some Hot Pepper Jelly or Roasted Garlic and Onion Jam for your “grown up” trail snacks, drop me line. MP3: Ludwig Van Beethoven – Symphony No. 8 In F Major, Op. 93: III. ****Actually, moss doesn’t only grow on the north side of trees, it just MOSTLY grows on the north side. Also, that rule only applies in the northern hemisphere–in the southern hemisphere, moss mostly grows on the south sides of trees. The reason is that in the northern hemisphere, because of the tilt of the Earth on its axis, the sun almost always appears to be a little south of directly overhead. That’s why rooms with windows facing south are brighter than rooms with windows facing north. This is important for the mosses because the north sides of trees (in the northern hemisphere) are shadier and therefore moister. The south sides of trees get more sunlight, so water evaporates faster there. Mosses need a lot of water for two reasons. One is that they’re not “vascular” plants–that means that they don’t have the plant version of a circulatory system, and they can’t move water around inside their bodies. All cells in a moss’ body need to have easy access to water from the environment. The second reason they need water is because their male reproductive cells can only survive by swimming in droplets of water. The only way these cells can get from one plant to another is to hope that a raindrop will cause the water they’re swimming in to be splashed onto a neighboring plant. If the surface that they live on (like a tree trunk) dries out, the moss will be unable to reproduce, and it will dry out. That’s much more likely to happen on the sunnier side of a tree trunk than on the shadier side. The same rule applies to rocks, fallen logs, or anything else that mosses might grown on. If it has a sunny side and a shady side, the moss will mostly grow on the shady side. In the northern hemisphere, that’s usually the northern side, and in the southern hemisphere, it’s usually the southern side. If you look closely enough, though, you’ll see exceptions. The texture of mosses is usually (but not always!) fuzzy because their leaves have many little projections on them, like the finger-like projections on a maple leaf. The moss leaves and their projections are so small, though, that they seem fuzzy to us. These projections are probably to help the moss cells deep inside the leaves to be as close as possible to external water sources. Last week, after a friend sent me a link to the army cutlery set pictured above, I couldn’t remember using any sort of camp utensil much this summer. I don’t know if that means that there was a lack of effort on my part in making dinner, or if it was purely a realization that I just enjoy a sandwich-ish something more than a big bowl or rice and beans. I’m sure it’ll change as the temperatures drop. Usually does. And I’ve never really enjoyed the Light My Fire thing, but I did encounter an AT hiker in VT this summer that was stoked on his titanium version. He had already broken four or so of the plastic version while scooping out peanut butter. 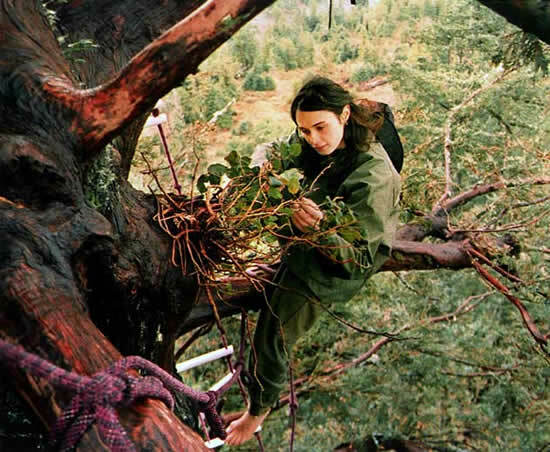 Julia Butterfly Hill is a famously eloquent environmental activist, who, from December 1997 to December 1999, lived atop a 1500-year-old California Redwood tree on a tiny, handbuilt platform. She spent 738 days more than 180 feet off the ground on one of the most successful tree sits in Earth First!‘s history of organized action. You can watch the entire 2000 documentary about Julia Butterfly’s tree sit until September 30 over at PBS. What can I say? I’m a sucker for these types of things. Especially that handsome Lakes Of The Clouds one. I’m kind of a backcountry-coffee-snob (like so many of us are), but not in the sense that I’m really picky about what I’m drinking. It’s just always one of the first things in my pack. 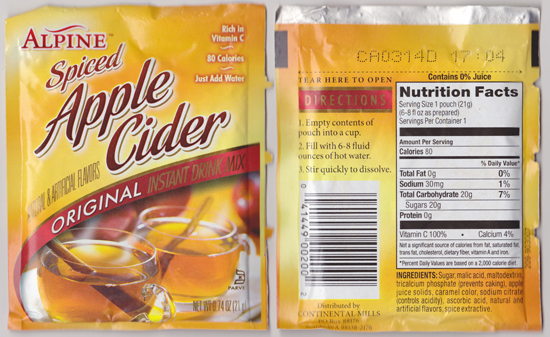 Second best, alongside your Knorr sauce packets and ramen, is powdered apple cider. Super light, and one of the best fall-time recovery drinks. Sure, your palette becomes a little more critical this time of year when the cider mills are really gearing up, but who’s lugging a gallon above the treeline? I take mine straight, but I’m sure this would be great hot-toddied-up. Got some recipes? Share ‘em. I am the bread of kindness and the flower of beauty. ‘Ye who pass by, listen to my prayer: Harm me not.